Vision Hawk - Compact yet powerful! The Vision HAWK is a flexible industrial smart camera that delivers powerful vision capabilities in a compact, easy-to-use package. Developed for vision users of all experience levels in a broad range of applications, the Vision HAWK features an intuitive vision interface, optional C-mount lens design, integrated lighting, high resolution optical zoom, and simple plug and play connectivity. With the Vision HAWK, both integrators and end-users have a scalable, fully integrated vision solution to confidently solve any inspection, verification, or auto ID application. Features a robust tool set to address a wide range of automation challenges using vision technology. Combined with patented liquid lens autofocus, the Vision HAWK can easily cover almost any vision or barcode application. High resolution modular optical zoom system enables the Vision HAWK to inspect objects and labels at distances from 33 mm to 2 m and beyond. 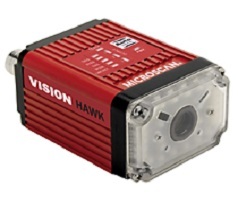 The Vision HAWK features a rugged industrial design with a cast alloy IP65/67 enclosure and M12 connectors. Integrated Ethernet protocols are included for high speed communication.